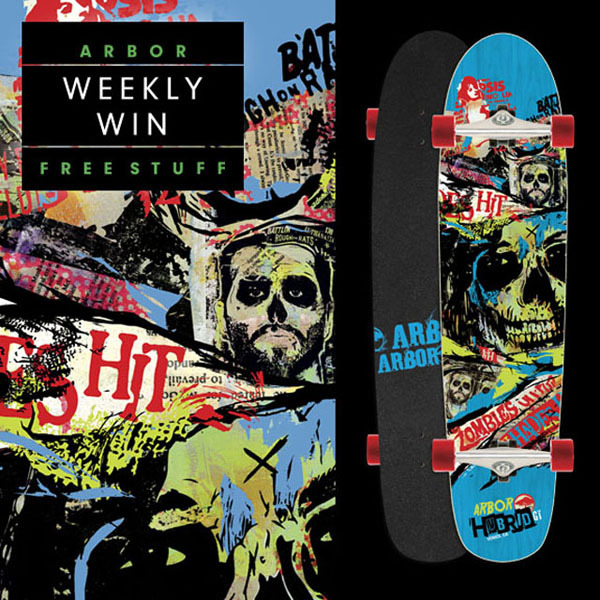 Arbor ‘Hybrid GT’ Skateboard Givaway. Free stuff! Oh yeah! Arbor is giving away a complete Hybrid GT Skateboard! The Hybrid GT is a very versatile board and was featured in this radical video: Kody Noble Shreds The Streets Of San Francisco. On the Arbor website, arborcollective.com, participants must make a quick comment on any news story, (participants must make a real comment) in the comment section and write, “I want to win free Arbor stuff!” A real full name and email address must be used so Arbor can contact the winner. Then participants must also make a Facebook Like and/or Twitter Tweet on any news story to finish their entry (look for this option at the bottom of each news story). Upon submitting a comment and a Like and/or Tweet, participants will be entered into a random drawing. Within about one week, Arbor will post the winner’s name on the Arbor website, Facebook and Twitter. The lucky person will be contacted by Arbor to obtain pertinent information and the product will be shipped to their location. Participants may enter as many times as they like by commenting on and liking or tweeting multiple news stories. GOOD LUCK!